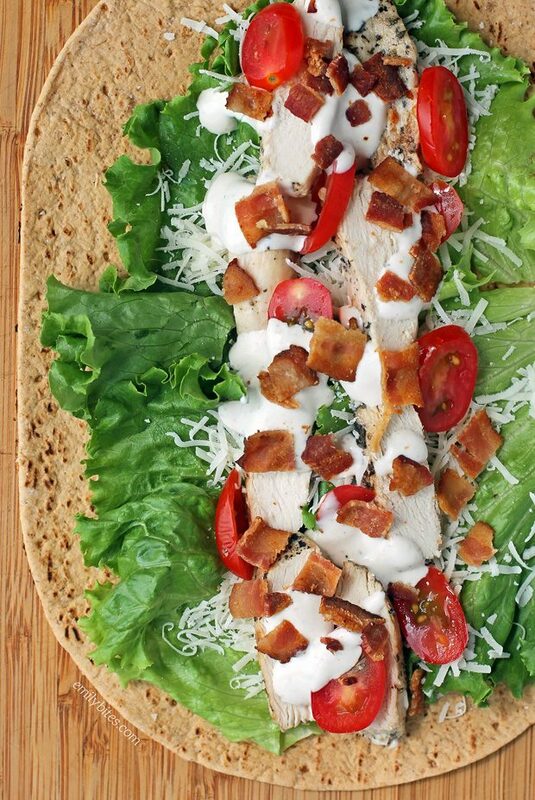 I have partnered with Flatout to create these Chicken Caesar Wraps. I have been compensated for my time commitment to work with their product, however my opinions are entirely my own and I have not been paid to publish positive comments. 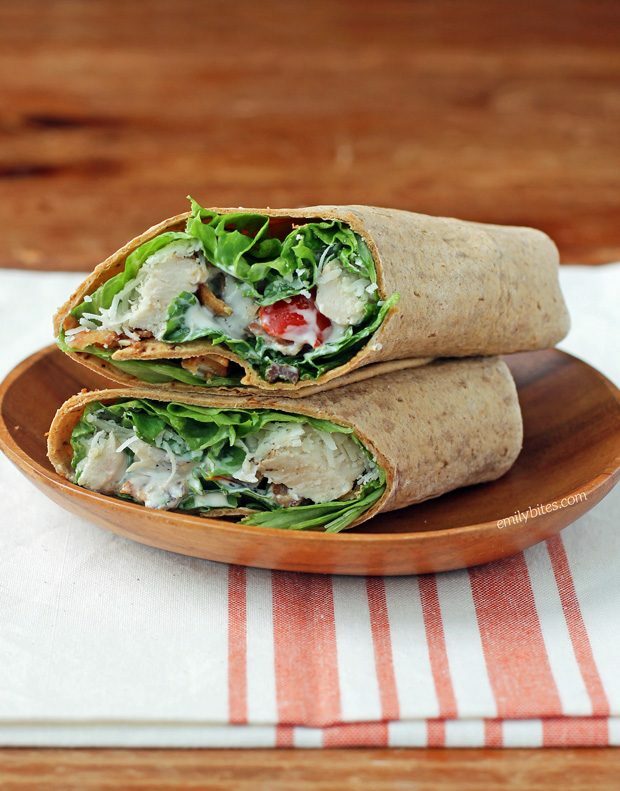 Take you lunch to the next level with these Chicken Caesar Wraps! Super easy to prep and pack and totally filling and delicious. I love the combination of the creamy Caesar dressing, smoky bacon, nutty parmesan, juicy tomatoes, fresh lettuce and hearty chicken all wrapped up in my favorite Light Original Flatout flatbreads. These wraps are also a great way to use up leftover chicken! I used grilled chicken from the dinner the night before in the wraps pictured here, but you can use shredded, rotisserie, or whatever type you have on hand. Don’t forget to check out my Easy Slow Cooker Shredded Chicken post- the perfect way to make shredded chicken for this recipe! The first time I made these Chicken Caesar Wraps for lunch, all I thought about while eating it was that I wanted to make more and have them again for dinner. That should tell you something! Not only are these Chicken Caesar Wraps delicious and under 300 calories or 6 Weight Watchers SmartPoints each, they’re also packed with 34 grams of protein and 8 grams of fiber, which should go a long way toward helping you stay full until your next meal! That’s one of the reasons I am obsessed with using the Light Original Flatout flatbreads for all my wraps (and pizzas too), they are full of protein and fiber and they taste great. I love working with Flatout and all of their amazing flatbreads. They’re ideal to always have on hand because all you need is your favorite toppings or fillings and in no time you have a perfect personalized pizza or wrap! Plus they make wraps for whatever you’re looking for: low carb, high fiber, high protein, low cal – they have it all. Want to see what other recipes I’ve made using Flatouts? Check out my Veggie Lover’s Flatbread, Black and Blue Steak Wraps, Spicy Southwest Chicken Wraps, Peaches and Cream Dessert Flats, Three Cheese Mushroom Flatbreads, Maple Bacon Breakfast Wraps, Chicken Saltimbocca Sandwiches, Buffalo Chicken Pinwheel Wraps, Spinach Artichoke Flatbreads, Greek Snack Flats, Mexi Burgers with Guacamole, Chinese Chicken Wrap, Chicken Pesto Flatbreads and Bacon Cheeseburger Wraps! Cook the bacon according to package directions. Set aside to drain on paper towels. Chop into small pieces. Fold in the rounded ends of each flatbread over the filling. Then fold one of the long edges over the filling and continue to roll until the wrap is completely rolled up. Cut in half and serve. It’s everything delicious, all rolled up into a magnificent package! I like that it’s friendly to those of us who watch our weight, and also our health. It’s going to be very hot & humid here for the next several days, so these wraps will be perfect for dinner with a salad, or a nice & cool (savory) vegetable gelatin mold. Thanks Emily! What is your favorite Cesar dressing? I forgot to mention: The best tasting bottled Caesar dressing I’ve ever tried is “Newman’s Own”. Their regular Caesar is exceptionally delicious, but they also make a light version which is very tasty…. for those of us who watch our intake of fats & calories. It’s really quite good. Are you going to be publishing a cookbook soon?